Digital systems are everywhere, mobile and desktop devices and networks are transforming learning, recreational activities, home life and work. 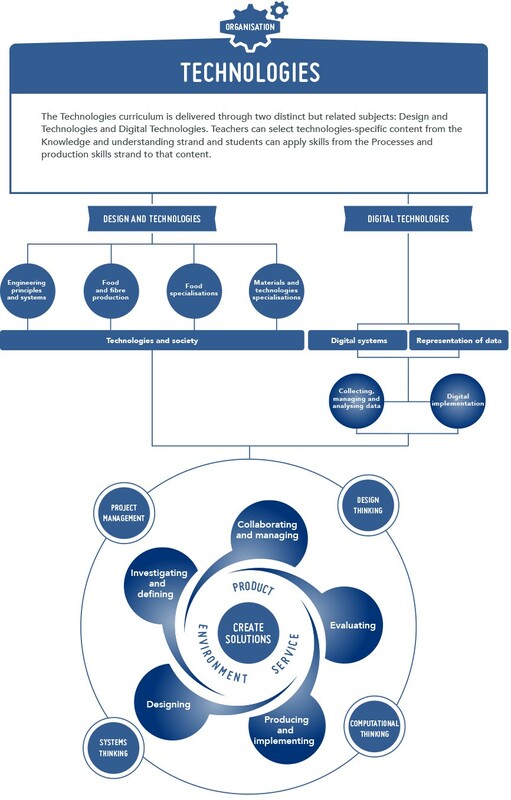 Digital systems support new ways of collaborating and communicating, and require new skills such as computational and systems thinking. Technologies are an essential problem-solving toolset in our knowledge-based society. The Western Australian Curriculum: Digital Technologies empowers students to shape change by influencing how contemporary and emerging information systems and practices are applied to meet current and future needs. A deep knowledge and understanding of information systems enables students to be creative and discerning decision-makers when they select, use and manage data, information, processes and digital systems to meet needs and shape preferred futures. Digital Technologies provides students with practical opportunities to use design thinking and to be innovative developers of digital solutions and knowledge. Digital Technologies enables students to become innovative creators of digital solutions, effective users of digital systems and critical consumers of information conveyed by digital systems. To be developed in 2015 using (assessment) work sample evidence to ‘set’ standards through paired comparisons. In Digital Technologies students are provided with practical opportunities to use design thinking and to be innovative developers of digital solutions and knowledge. Digital Technologies is a subject that has a specific curriculum and includes the practical application of the ICT general capability. The syllabus for each of these subjects describes the distinct knowledge, understanding and skills of each subject and, where appropriate, highlights their similarities and complementary learning. This approach enables students to develop a comprehensive understanding of traditional, contemporary and emerging technologies. It also provides the flexibility, especially in the primary years of schooling, for developing integrated teaching programs that focus on both Technologies subjects and concepts and skills in other learning areas. Teachers select technologies-specific content from the Knowledge and understanding strand and students apply skills from the Processes and production skills strand to that content. The common strand structure provides an opportunity to highlight similarities across the two subjects. The additional content will not be reflected in the Achievement Standards. The School Curriculum and Standards Authority is committed to the development of a high-quality curriculum for all Western Australian students that promotes excellence and equity in education. All students are entitled to rigorous, relevant and engaging learning programs drawn from the Western Australian Curriculum: Technologies. Teachers take account of the range of their students' current levels of learning, strengths, goals and interests and make adjustments where necessary. The three-dimensional design of the Western Australian Curriculum, comprising learning areas, general capabilities and cross-curriculum priorities, provides teachers with flexibility to cater for the diverse needs of students across Western Australia and to personalise their learning. In some cases, curriculum adjustments are necessary to provide equitable opportunities for students to access age-equivalent content in the Western Australian Curriculum: Technologies. Teachers can draw from content at different levels along the Pre-primary – Year 10 sequence. Teachers can also use the general capabilities learning continua in Literacy, Numeracy and Personal and social capability to adjust the focus of learning according to individual student need. Adjustments to the delivery of some practical aspects of lessons will be necessary to ensure some students with physical disability can access, participate, and achieve on the same basis as their peers. This might involve students using modified tools, materials or equipment to create solutions. Teachers may also need to consider adjustments to assessment of students with disability to ensure student achievement and demonstration of learning is appropriately measured. Students for whom English is an additional language or dialect (EAL/D) enter Western Australian schools at different ages and at different stages of English language learning and have various educational backgrounds in their first languages. While many EAL/D students bring already highly developed literacy (and numeracy) skills in their own language to their learning of Standard Australian English, there are a significant number of students who are not literate in their first language, and have had little or no formal schooling. While the aims of the Western Australian Curriculum: Technologies are the same for all students, EAL/D students must achieve these aims while simultaneously learning a new language and learning content and skills through that new language. These students may require additional time and support, along with teaching that explicitly addresses their language needs. Students who have had no formal schooling will need additional time and support in order to acquire skills for effective learning in formal settings. Teachers can use the Western Australian Curriculum: Technologies flexibly to meet the individual learning needs of gifted and talented students. Teachers can enrich students' learning by providing them with opportunities to work with learning area content in more depth or breadth (e.g. using the additional content descriptions); emphasising specific aspects of the general capabilities learning continua (e.g. the higher order cognitive skills of the critical and creative thinking capability); and/or focusing on cross-curriculum priorities. Teachers can also accelerate student learning by drawing on content from later year levels in the Western Australian Curriculum: Technologies and/or from local, state and territory teaching and learning materials. Technologies education pedagogy and project-based learning allows students to take greater responsibility for their learning and allows them to make decisions based on findings from research, experimentation and testing of design ideas. 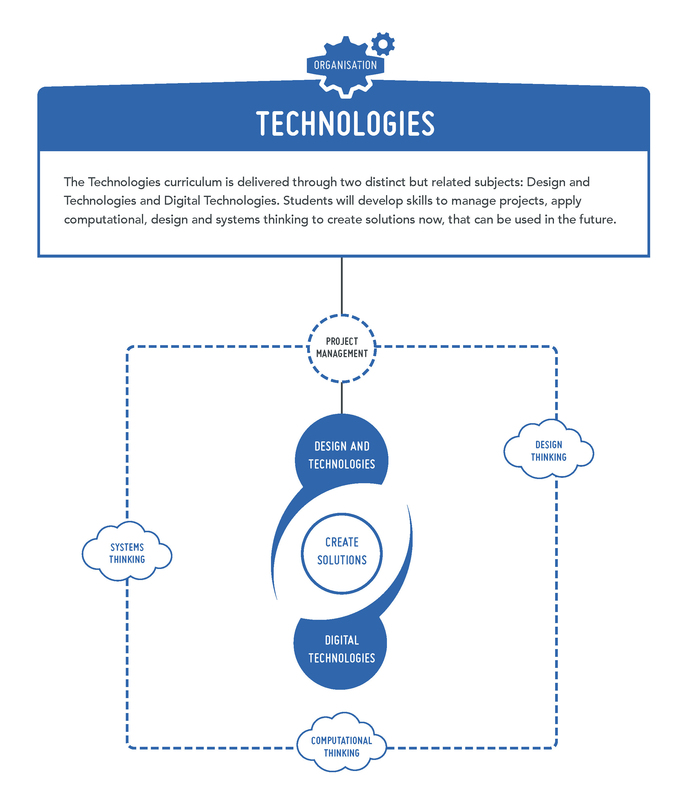 The Technologies learning area is made up of two distinct subjects Design and Technologies and Digital Technologies. The content is presented through the interrelated strands of Knowledge and understanding and Processes and production skills. The strands are different in each subject; with common threads to allow for integration between the Technologies subjects. Knowledge and understanding is taught in combination with the processes and production skills. create product, service and environment designed solutions. Materials and technologies specialisations – in this context the focus is on a broad range of traditional, contemporary and emerging materials and specialist areas that typically involve extensive use of technologies, this includes materials such as, textiles, metal, wood and plastics. Digital Technologies is a subject that has a specific curriculum and includes the practical application of the ICT general capability. 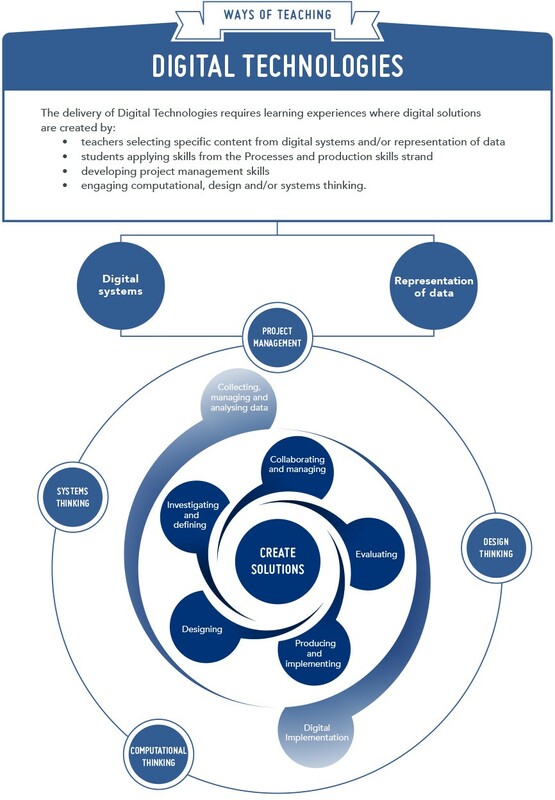 In Digital Technologies, students develop an understanding of the characteristics of data, digital systems, audiences, procedures and computational thinking. They apply this when they investigate, communicate and create digital solutions. The ICT capability involves students in learning to make the most of the technologies available to them, adapting to new ways of doing things as technologies evolve, and limiting the risks to themselves and others in a digital environment. The clear difference between the Digital Technologies curriculum and the ICT general capability is that the capability helps students to become effective users of digital technologies while the Digital Technologies curriculum helps students to become confident developers of digital solutions. In the primary years, the Technologies subjects are often interrelated and connected through other learning areas. When programming, teachers can use the Technologies learning area as a basis for the practical application and development of concepts from other learning areas. For example, students' mathematical ability to solve problems involving linear equations can be used in Technologies when investigating quantitative relationships and designing algorithms. In the secondary years, Technologies is typically a specialist area, with both subjects and each of the contexts taught by specialist teachers. the teacher and students identify the problem, situation or need that requires a solution, considering resources available. play and experiment with technologies to investigate possible solutions. For information on how to collect evidence to inform planning for ongoing learning experiences in Technologies refer to 'Ways of Assessing'. The 'ways of assessing' complement 'ways of teaching' and aim to support teachers in developing effective assessment practice in Technologies. Refer to the Western Australian Curriculum and Assessment Outline (http://k10outline.scsa.wa.edu.au/) for further guidance on assessment principles, practices and phases of schooling. How do you identify the next skill or understanding a student or group of students needs to learn? 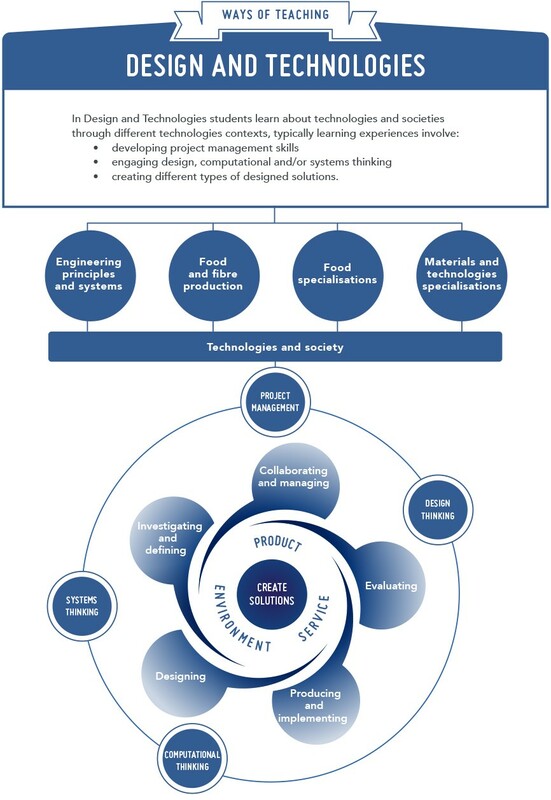 In the Western Australian Curriculum: Technologies the two strands, Knowledge and understanding and Processes and production skills, are interrelated and inform and support each other. When developing assessment strategies, teachers combine components of the strands in different ways to provide students with opportunities to demonstrate their knowledge and understanding through the practical application of their skills, (e.g. students may be asked to consider the implications of technologies in society when designing a solution to a problem, situation or need). The assessment experiences and evidence collected may look different for individual tasks as the assessment strategies should match the design brief and be reflective of individual students' understandings and interpretation of the solution they are creating. Refer to the Judging Standards tool in the Western Australian Curriculum and Assessment Outline (http://k10outline.scsa.wa.edu.au/home/judging-standards) when reporting against the Achievement Standards; giving assessment feedback; or explaining the differences between one student's achievement and another's. The observations of student understandings and process and production skills through the use of anecdotal notes, checklists, photographs, videos or recordings. Collaborating and managing is one of the production and processes skills, this needs to be actively programmed for and assessed in accordance with the relevant year's content description. During group work, teachers should stop at key points to check individual student understanding. The recording of student achievement in physical and verbal activities such as role-plays, performances, speeches, play-based learning, debates or online discussions. The demonstration of learning through activities such as virtual and actual fieldwork, to inform the creation of digital and designed solution. Collections of student work that provide long-term documentation of student progress and achievement. Portfolios may be subject area specific or contain a range of work undertaken by the student and be evidence of project management. These may include verbal questioning, multiple choice, short answer responses or open-ended questions that require longer, sustained written responses. This includes short and extended written tasks. These may take the form of short responses such as worksheets and sentence or paragraph answers. Longer responses may include essays, information reports or imaginative texts such as narratives and journal entries. Students may also conduct investigations in which they must develop questions; gather, analyse and evaluate information; communicate on findings and reflect upon conclusions. Frameworks, including digital, that help structure thinking. They make thinking processes visible by showing connections between data. Examples include concept maps, flowcharts and cause-and-effect patterns. The demonstration of learning through, algorithms, tables, graphs, diagrams, posters, brochures, photographs and other digital media (e.g. slides, animations, blogs). The demonstration of learning in role-play, speeches, simulations, debates and structured discussions. Discussions or interviews that are conducted either face-to-face, online or via audio and video recordings. The self-reflection of achievement and progression towards goals. It allows for metacognitive thinking about their learning and personal reflection upon their strengths and weaknesses. Journals provide personal accounts of student responses to learning activities, experiences and understandings. This should be guided by the relevant year's content description on Evaluating. Individuals, peers or a group of peers provide evaluative feedback on performance or activity. The general capabilities encompass the knowledge, skills, behaviours and dispositions that will assist students to live and work successfully in the 21st century. Teachers may find opportunities to incorporate the capabilities into the teaching and learning program for Technologies. The general capabilities are not assessed unless they are identified within the content. Across the Western Australian Curriculum, students become literate as they develop the knowledge, skills and dispositions to interpret and use language confidently for learning and communicating in and out of school and for participating effectively in society. Literacy involves students in listening to, reading, viewing, speaking, writing and creating oral, print, visual and digital texts, and using and modifying language for different purposes in a range of contexts. In Technologies, students develop literacy as they learn how to communicate ideas, concepts and detailed proposals to a variety of audiences; read and interpret detailed written instructions for specific technologies, often including diagrams and procedural writings such as software user manuals, design briefs, patterns and recipes; prepare accurate, annotated engineering drawings, software instructions and coding; write project outlines, briefs, concept and project management proposals, evaluations, engineering, life cycle and project analysis reports; and prepare detailed specifications for production. By learning the literacy of technologies students understand that language varies according to context and they increase their ability to use language flexibly. Technologies vocabulary is often technical and includes specific terms for concepts, processes and production. Students learn to understand that much technological information is presented in the form of drawings, diagrams, flow charts, models, tables and graphs. They also learn the importance of listening, talking and discussing in technologies processes, especially in articulating, questioning and evaluating ideas. Across the Western Australian Curriculum, students become numerate as they develop the knowledge and skills to use mathematics confidently across all learning areas at school, and in their lives more broadly. Numeracy involves students in recognising and understanding the role of mathematics in the world and having the dispositions and capacities to use mathematical knowledge and skills purposefully. The Technologies curriculum gives students opportunities to interpret and use mathematical knowledge and skills in a range of real-life situations. Students use number to calculate, measure and estimate; interpret and draw conclusions from statistics; measure and record throughout the process of generating ideas; develop, refine and test concepts; and cost and sequence when making products and managing projects. In using software, materials, tools and equipment, students work with the concepts of number, geometry, scale, proportion, measurement and volume. They use three-dimensional models, create accurate technical drawings, work with digital models and use computational thinking in decision-making processes when designing and creating best-fit solutions. Across the Western Australian Curriculum, students develop ICT capability as they learn to use ICT effectively and appropriately to access, create and communicate information and ideas; solve problems; and work collaboratively in all learning areas at school, and in their lives beyond school. The capability involves students in learning to make the most of the technologies available to them, adapting to new ways of doing things as technologies evolve, and limiting the risks to themselves and others in a digital environment. In Digital Technologies, students develop an understanding of the characteristics of data, digital systems, audiences, procedures and computational thinking. They apply this when they investigate, communicate and create digital solutions. Students learn to formulate problems, logically organise and analyse data and represent them in abstract forms. They automate solutions through algorithmic logic. Students decide the best combinations of data, procedures and human and physical resources to generate efficient and effective digital solutions. They create digital solutions that consider economic, environmental and social factors. In Design and Technologies, key ICT concepts and skills are strengthened, complemented and extended. Students become familiar with and gain skills using a range of software applications and digital hardware that enable them to realise their design ideas. Students use ICT when they investigate and analyse information and evaluate design ideas and communicate and collaborate online. They develop design ideas; generate plans and diagrams to communicate their designs and produce solutions using digital technologies, for example creating simulations, drawings and models and manufacturing solutions (from basic drawing programs to computer-aided design/manufacture and rapid prototyping). Across the Western Australian Curriculum, students develop capability in critical and creative thinking as they learn to generate and evaluate knowledge, clarify concepts and ideas, seek possibilities, consider alternatives and solve problems. Critical and creative thinking are integral to activities that require students to think broadly and deeply using skills, behaviours and dispositions such as reason, logic, resourcefulness, imagination and innovation in all learning areas at school and in their lives beyond school. Students develop capability in critical and creative thinking as they imagine, generate, develop and critically evaluate ideas. They develop reasoning and the capacity for abstraction through challenging problems that do not have straightforward solutions. Students analyse problems, refine concepts and reflect on the decision-making process by engaging in systems, design and computational thinking. They identify, explore and clarify technologies information and use that knowledge in a range of situations. Across the Western Australian Curriculum, students develop personal and social capability as they learn to understand themselves and others, manage their relationships, lives, work and learning more effectively. The personal and social capability involves students in a range of practices including recognising and regulating emotions, developing empathy for and understanding of others, establishing positive relationships, making responsible decisions, working effectively in teams and handling challenging situations constructively. Students develop personal and social capability as they engage in project management and development in a collaborative workspace. They direct their own learning, plan and carry out investigations, and become independent learners who can apply design thinking, technologies understanding and skills when making decisions. Students develop social and employability skills through working cooperatively in teams, sharing resources and processes, making group decisions, resolving conflict and showing leadership. Designing and innovation involve a degree of risk-taking and as students work with the uncertainty of sharing new ideas they develop resilience. The Technologies learning area enhances students' personal and social capability by developing their social awareness. Students develop understanding of diversity by researching and identifying user needs. They consider past and present impacts of decisions on people, communities and environments and develop social responsibility through understanding of, empathy with and respect for others. Across the Western Australian Curriculum, students develop ethical understanding as they identify and investigate ethical concepts, values, character traits and principles, and understand how reasoning can assist ethical judgement. Ethical understanding involves students in building a strong personal and socially oriented ethical outlook that helps them to manage context, conflict and uncertainty, and to develop an awareness of the influence that their values and behaviour have on others. Students develop the capacity to understand and apply ethical and socially responsible principles when collaborating with others and creating, sharing and using technologies – materials, data, processes, tools and equipment. Using an ethical lens, they investigate past, current and future local, national, regional and global technological priorities. When engaged in systems thinking students evaluate their findings against the criteria of legality, environmental sustainability, economic viability, health, social and emotional responsibility and social awareness. They explore complex issues associated with technologies and consider possibilities. They are encouraged to develop informed values and attitudes. Across the Western Australian Curriculum, students develop intercultural understanding as they learn to value their own cultures, languages and beliefs, and those of others. They come to understand how personal, group and national identities are shaped, and the variable and changing nature of culture. The capability involves students in learning about and engaging with diverse cultures in ways that recognise commonalities and differences, create connections with others and cultivate mutual respect. Students consider how technologies are used in diverse communities at local, national, regional and global levels, including their impact and potential to transform people's lives. They explore ways in which past and present practices enable people to use technologies to interact with one another across cultural boundaries. Students investigate how cultural identities and traditions influence the function and form of solutions, products, services and environments designed to meet the needs of daily life now and in the future. The cross-curriculum priorities address the contemporary issues that students face in a globalised world. Teachers may find opportunities to incorporate the priorities into the teaching and learning program for Technologies. The cross-curriculum priorities are not assessed unless they are identified within the core content. In the Western Australian Curriculum: Technologies, the priority of Aboriginal and Torres Strait Islander histories and cultures may provide creative, engaging and diverse learning contexts for students to value and appreciate the contribution by the world's oldest continuous living cultures to past, present and emerging technologies. In the Technologies learning area, students explore how Aboriginal and Torres Strait Islander Peoples' capacity for innovation is evident through the incorporation and application of a range of traditional, contemporary and emerging technologies and practices to purposefully build and/or maintain cultural, community and economic capacity. Students may apply this knowledge and understanding throughout the processes of observation, critical and creative thinking, action, experimentation and evaluation. In the Western Australian Curriculum: Technologies, the priority of Asia and Australia's engagement with Asia provides diverse and authentic contexts to develop knowledge and understanding of technologies processes and production and related cultural, social and ethical issues. It enables students to recognise that interaction between human activity and the diverse environments of the Asia region continues to create the need for creative solutions and collaboration with others, including Australians, and has significance for the rest of the world. In the Western Australian Curriculum: Technologies, the priority of sustainability provides authentic contexts for creating preferred futures. When students identify and critique a problem, need or opportunity; generate ideas or concepts; and create solutions, they give prime consideration to sustainability by anticipating and balancing economic, environmental and social impacts. Technologies focuses on the knowledge, understanding and skills necessary to design for effective sustainability action. It recognises that actions are both individual and collective endeavours shared across local, regional and global communities and provides a basis for students to explore their own and competing viewpoints, values and interests. Understanding systems enables students to work with complexity, uncertainty and risk; make connections between disparate ideas and concepts; self-critique; and propose creative solutions that enhance sustainability.